Back then, the thought of writing a food blog hadn’t even entered my head. The online world was a very different place: basic WordPress was only just up and running, Facebook in its infancy and YouTube launched that year. Blogs like Delicious Days and Seven Spoons might have just got started, but the idea of writing about food on the internet was still just the seed of an idea in the minds of Joy the Baker, Deb Perelman and numerous other bloggers we know and love today. While my twenty year old self didn’t write about or photograph food (I had much more important things to do as a student, like getting drunk, watching daytime TV and occasionally attending lectures…), I absolutely loved to bake. So when Carnivorous Boyfriend came over for tea just a couple of days into our relationship, I decided to bake him a batch of brownies. I’m pretty sure I’ve mentioned this incident on the blog before. While my Mum’s recipe for brownies is both incredible and fail safe, our ancient university oven was absolutely not and my brownies emerged crisp on the top but pretty much raw in the middle, puddles of molten chocolate pooling outwards as I attempted to cut them into squares. Luckily I managed to prevent myself from crying, swearing, stamping my feet or any of the other various emotions I’ve displayed at kitchen disasters over the years (the lucky boy has probably been subjected to more than enough of this in the years since, but you’ve got to retain some sort of air of mystery for those first few dates right?) and we both saw the funny side, happily tucking into our brownie soup by the spoonful. Back then I could never have predicted we’d fall so completely and utterly in love, that we’d be getting married and that those were the first few days of the rest of our lives together. Neither could I have predicted that, almost eight years to the day, I’d be serving up a second round of chocolaty soup in the form of these slightly under-baked – but ever so delicious – chocolate peanut butter fondants. I baked these for dessert on Friday night, pulling two seemingly picture perfect golden domes from the oven as utterly irresistible aromas of chocolate and peanut wafted round the kitchen. 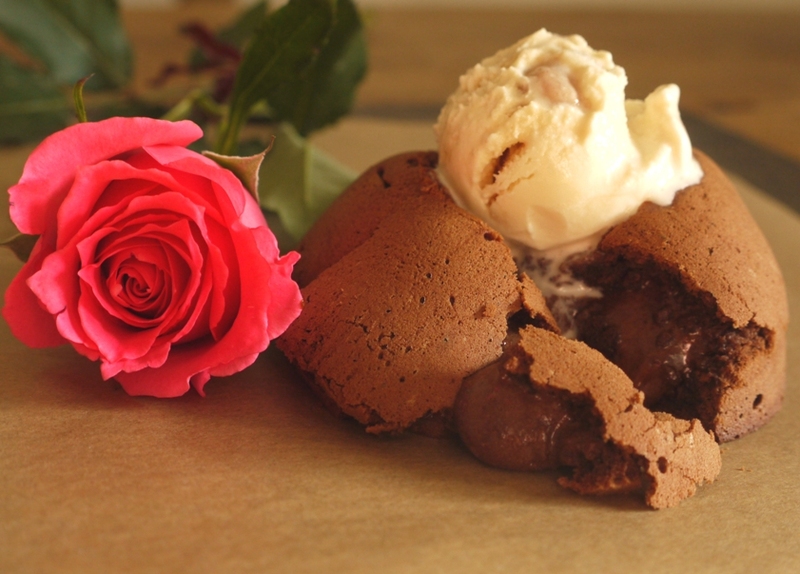 Tipped onto two plates, the fondants held their shape beautifully as I scooped over generous dollops of ice cream . . . before promptly collapsing in on themselves in a flood of molten chocolate. I’d forgotten to allow any additional baking time to make up for the hours they’d sat in the fridge during the day and they simply hadn’t been baked for long enough. We ate our lava-like puddings with smiles on our faces and chocolate running down our chins, the hot liquid contrasting with cool ice cream to make the most amazingly decadent dessert. They may not have been perfect, but they tasted amazing and they made us both smile remembering that eight-year-old incident with the brownies. Who knows what we’ll be eating in another eight years, what we’ll be doing and where this blog will be. Life is unpredictable, exciting and surprising and I’m quite happy to keep it like that. Provided, of course, that some sort of constant remains in the form of love. And chocolate, obviously. 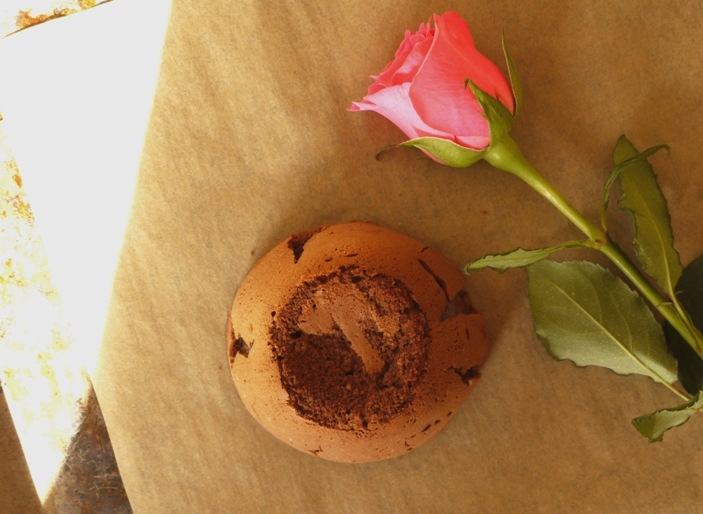 Under-bake these fondants & the edges will start to implode! Preheat the oven to 200 degrees C. Grease four little pudding moulds and line the bottom with a circle of parchment. In a heatproof bowl suspended over a pan of boiling water, melt the chocolate. Stir in the peanut butter and remove from the heat to cool slightly. Cream together the butter and sugar until light and fluffy. Gradually add the eggs until fully incorporated, then beat in the fleur de sel and vanilla extract followed by the cooled chocolate mixture. Fold in the flour with a metal spoon until just combined then divide between the four moulds. Bake your fondants for 10 minutes until set around the edges but slightly gooey in the middle. If you make them ahead and refrigerate, they will need an extra 2 – 3 minutes. 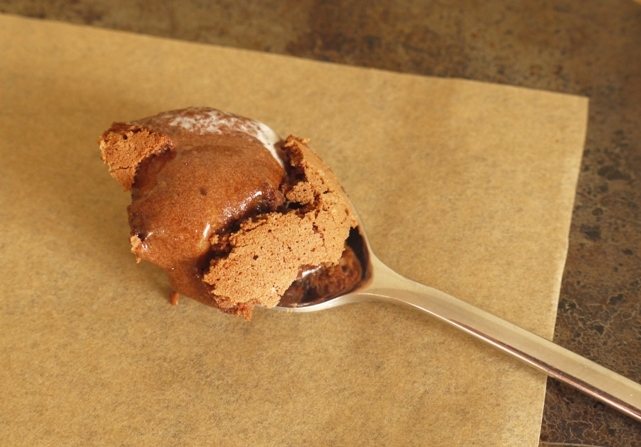 These fondants can also be baked in little ramekins and not turned out. Not quite as spectacular if they turn out right, but possibly a safer bet if you’re worried that you may have under-baked them. Either way, they will be delicious. You have managed to make the ‘chocolaty soup’ sound utterly delicious. Looking forward to the next chocolate surprise in 8 years time. These look super delicious! Love the molten centre! Yum! They look so oozy and spectacular! Great work. Oh this is such a very lovely post, you two obviously have such a wonderful relationship and I’m so excited to see what the next 8 years bring you! The molten centre is usually the tastiest part:) yummy! As long as love, and chocolate, are constant, life will always be good. I can get behind that! Aww bless! You’re much more self-controlled than I am, I would have cried at the brownie disaster. My boyfriend is also the unfortunate spectator of these kitchen outbursts on a regular basis. Best of luck to both of you! We all like a bit of oozing when chocolate puddings are concerned and undercooking has to be better than overcooking at a time like this. Anything with peanut butter in it and I am sold, they look dreamy. Really lovely post, puds look great too! Lovely story, and delicious looking dessert. Any preferred peanut butters to use? I find it so hard to find one that tastes like those in reese’s PB cups! I pretty much always use natural peanut butter, so no added sugar or salt. If you want it like the middle of Reese’s Cups, I’d suggest something smoother and sweeter – one of the more commercial brands. Hope that helps! hehe thank you – my sweet tooth is just too dominant! I will try the sweeter, commercial kind thanks. Lucky him – those look delicious. What a successful fail that was! Haha, I literally laughed out loud when I read the part about how you have subjected your boyfriend to many food-related melt-downs over the year, but at least in the beginning you wanted to retain a sense of mystery (no need to let them see all problems in the beginning!). Sounds exactly like me! Lovely story though. And these fondants look amazing, amazing. Happy Anniversary to you both! And what a decadent delicious dessert to be celebrating with….!! I am sure you will be spending many more anniversaries enjoying chocolate in one form or another and I cannot imagine these fondants being anything other than delicious regardless of a little bit of undercooking. I don’t know anyone that would mind a little peanutty chocolate sauce to enjoy with a spoonful of ice cream. Such an exciting year ahead for you! YUM! I know what you mean about meeting the right person. And bonding over molten chocolate baked goods. Congratulations on your eight year anniversary! These fondants look absolutely delicious. We definitely all have those fails once in a while…and if you can laugh about it today than it was certainly all for the best. 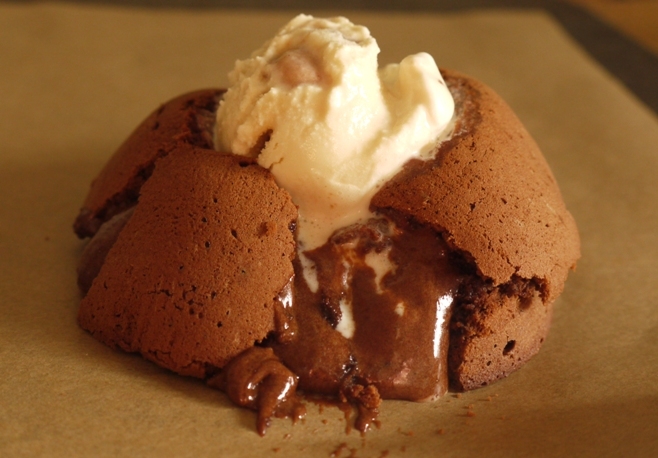 Besides…who doesn’t love molten chocolate! Even if you didn’t quite mean for them too turn out so runny, I think I under bake on purpose! It looks so delicious! Oh man, this looks sooo good! Must give it a try. Mmmm look at those gooey centres! I would definitely want to order this in a restaurant! Oh, this is so wonderful! Happy anniversary to you. I love this sweet post. May every day be as delicious as the last. Thank you Sacha, what a lovely comment 🙂 Here’s to delicious days! And thank you all for your lovely comments, means a lot to me! ooooo, looks so good, is it rude to want it for breakfast! Happy Happy Anniversary and what a lovely story! And wow these molten lava cakes are amazing and I think they are just perfect! And brilliant to add peanut butter! I have to try these! I think you have the perfect story about your first dates! 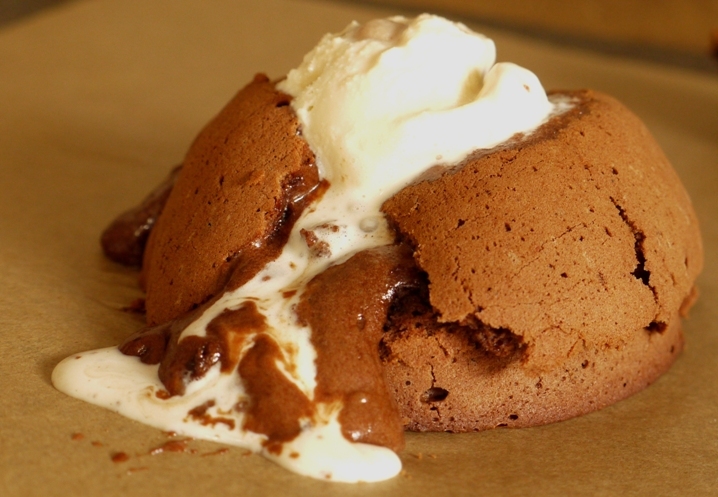 Molten chocolate is always good, and with peanut butter just got better. Happy anniversary! Happy Anniversary to you! I too have been with my man a long time (almost 9 years) and we got engaged over Christmas – woop! Food has defined so many of our moments together – from trying to drunkenly cook a frozen waffle in a toaster (when we first met as students) to eating spectacular Michelin starred dinners. Hope the two of you have many more culinary and life adventures to come in your years ahead.